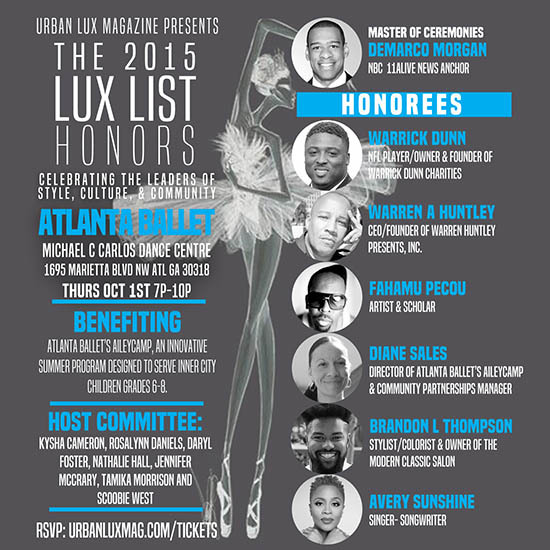 Every quarter since 2009, Urban Lux Magazine has shined a spotlight on local Atlanta businesses, non-profit organizations and individuals who make positive impacts on their communities. Our annual fall issue, entitled THE LUX LIST, features a hand-picked set of leaders who excel in the areas of STYLE, CULTURE and COMMUNITY. 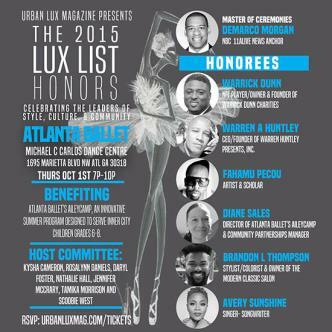 On Thursday, October 1, 2015, we present the fifth annual LUX LIST HONORS honoring NFL player/owner and Founder of Warrick Dunn Charities, Inc, Warrick Dunn; CEO/Founder of Warren Huntley Presents, Inc, Warren Huntley; artist and scholar, Fahamu Pecou; stylist and owner of Moderen Classic Salon, Brandon L. Thompson; Director of Atlanta Ballet’s AileyCamp & Community Partnership Manager, Diane Sales and Singer-Songwriter, Avery Sunshine. Hosted by NBC 11 Alive News evening anchor, DeMarco Morgan, our esteemed honorees will be presented an award and introduced to our readers, special guests and prominent media outlets. This exclusive invite only event will benefit Atlanta Ballet’s AileyCamp, an innovative summer dance program designed to serve inner-city children grades six through eight.